Join the conversation. It would be easy for Disney to sit back and let their fans do all the work for them, but instead they are capitalizing on the conversation already happening around their brand. Disney created frames based on their movies and gave their fans the opportunity to upload photos to co-create shareable content with them, increasing Disney’s brand visibility. Embed on your website. 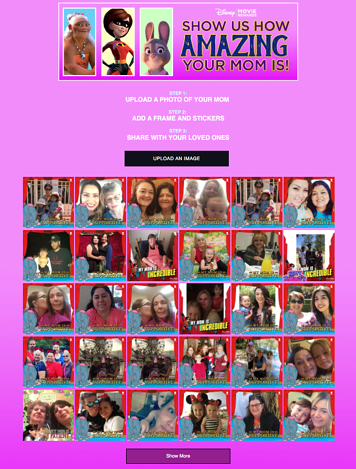 Disney promoted their Disney Rewards Program through their Mother’s Day Photo Lab and made the smart choice to embed the Photo Lab on the Disney Movie Rewards website, keeping consumers on the site and encouraging them to learn more about reward offers that they may be of interest. Fans are the best form of advertising and even if a brand doesn’t have a fan base on the scale of Disney, they can still benefit from adapting their digital marketing strategy to energize and elevate the conversations already taking place. Interested in other tips and examples on how your brand can drum up some excitement and get consumers participating this Mother’s Day? Read our other blog post on Mother's Day campaigns here.